Wed., April 20, 2016, 3:09 p.m.
Browns Lake, a fly-fishing-only trout lake in Pend Oreille County is below a ridge that burned in the summer 2015 Tower Fire. Wildfires that scorched hundreds of thousands of acres in 2015 have left some northeastern Washington fishing waters inaccessible, at least for the start of the 2016 fishing season. 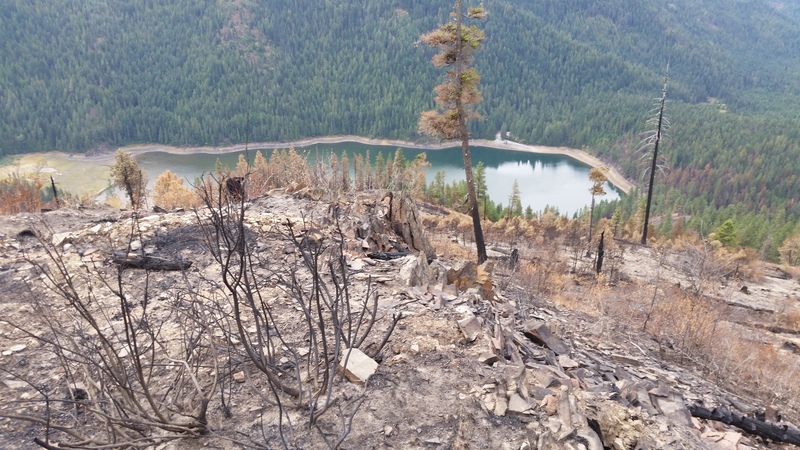 Hazardous standing snags, blowdowns, landslides and potential washouts are posing dangers, especially in Colville National Forest areas denuded by the fires, officials say. Anglers should expect access restrictions to Browns (near Usk) in Pend Oreille County, as well as Renner, Fish, Ferry, Long and Swan lakes in Ferry County, said Forest Service spokesman Franklin Pemberton. He said he did not expect fire closures to impact Davis Lake in Ferry County or Halfmoon in Pend Oreille County. “Crews will be working to get the areas cleared of hazard trees as quickly as possible as the snow comes off,” Pemberton said. “We are still reminding visitors that they should check with their local ranger station before heading out into the woods. “Conditions are changing quickly and closures could be adjusted as roads may be impacted due to flooding or slides around the burned areas,” he added. Published: April 20, 2016, 3:09 p.m.